Demand for slate-shaped tablets is declining even faster than expected. For all of 2016, global tablet shipments will drop by 9.6% over 2015, market research firm IDC forecast this week, marking the second straight year of decline. In March, IDC had forecast a decline of 6% for this year. The decline will occur even when newer detachable tablets, often called 2-in-1s, are included with slate tablets, IDC said. "The impact of the decline of slates is having a bigger impact, faster than we thought. They are not coming back," said IDC analyst Jean Phillippe Bouchard in an interview. But Bouchard was quick to add that slates are not disappearing entirely. There will continue to be a robust market for small slate tablets, under 8 inches, that are sold for less than $125 by Amazon and others, primarily for use by children. "There will also continue to be a slate market for commercial uses in healthcare, education and hospitality, so there are a lot of use cases for slates saying that slates are not going away," he said. "There will still be a need for slates but not as great as in 2010." IDC said well over 100 million slate tablets will ship annually through 2020. As IDC and others have said in the past, slate tablets have saturated the market. "Everyone wanting a slate has one, and there's very little reason to replace it or upgrade it," Bouchard added. IDC pegged the total tablet market of both slates and detachables at 207 million units shipped in 2015, but that figure will decline to about 187 million in 2016. IDC didn't release its forecast for years beyond 2016, but said the market will continue to decline in 2017 before having a "slight rebound in 2018 and beyond, driven by detachable tablet growth." Even by 2020, the market will not have rebounded to above 2015 levels, IDC said. Detachables are now 16% of the total tablet market and will grow to 31% of the market in 2020, IDC said. Using IDC's definition, detachables include Microsoft's Surface Pro 4 (starting at $899) (Amazon price - What's this?) with a basic Surface Pro 4 Type cover that doubles as a keyboard (at $129) and the iPad Pro (starting at $799) with the Smart Keyboard (at $169). There are also low-cost Android detachables, such as the RCA Viking Pro, starting at $99 at WalMart (Amazon price). Google makes the Pixel C, running Android 6.0 and starting at $499 (Amazon price) that features an optional Pixel C keyboard for an added $149. Samsung launched the 12-in. 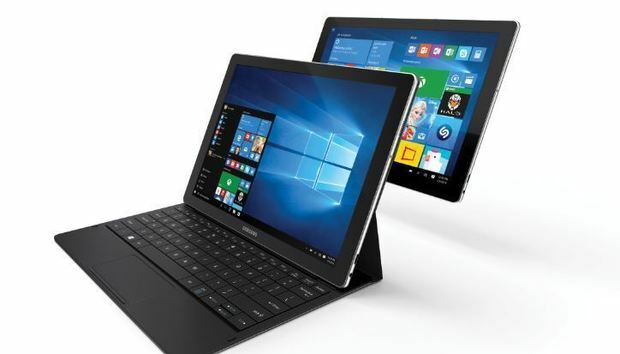 Galaxy TabPro S in January running Windows 10, which just went on sale for $900 (Amazon price). IDC's latest forecast also includes a marked increase in demand for Apple detachable tablets, primarily due to the buyer excitement over the smaller, 9.7-in. iPad Pro (starting at $599) (Amazon price) with Smart Keyboard ($149) that started shipping in the first quarter of 2016. IDC this week increased its March forecast for 2016 for Apple tablets to a 38% share of all tablets, up from 28% and for 2020 to 29%, up from 7.3%. "The main volumes of the smaller iPad Pro have occurred in the second quarter, and we believe it will spur replacement of the iPad installed base," Bouchard said.